It’s amazing what you discover when you experiment. I do it all the time, and I am constantly learning. So this photo below is my study the way it was. For information about the chairs, click here. This is the extra rug that was in the dining room. Did you see my giveaway for November? 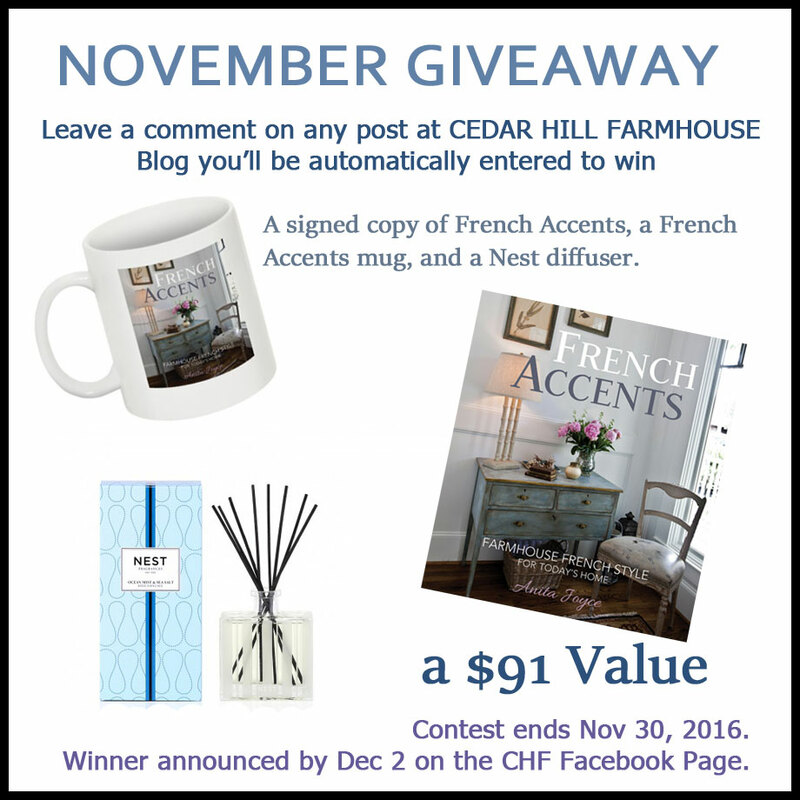 Any comment during November on any post at Cedar Hill Farmhouse Blog automatically enters you to win!!! You can comment on older posts and the post for the day. They will all enter you to win!! Details here. It’s a gorgeous rug and of course I wanted to use it somewhere. So I moved it to the study. With the new rug, while I was moving furniture around, I decided to try some new arrangements. So I moved both chairs from the window wall to the front of the desk. This felt crowded as you look in the office. It was more symmetrical, but wasn’t working from a practical stand point. So I moved the chairs on the diagonal. There’s a lot more room to walk around the chairs now. I really like the space better from a use standpoint. And I love the rug in here. The blue is so pretty. I realize now that the space works better with a bigger rug. We discussed this is the posts HERE and HERE. It’s difficult to get a feel for a space just from photos, but you are getting an idea of the space I think. Now, what did I do with the rug with the alphabet? I’ll show you that later. I still have to photograph it. This blue rug is no longer available, I am sad to say. The alphabet rug is no longer available where I purchased it. So amazing what just a little change can make a space feel like. Love the chairs in their new spots! I moved my dining table diagonally and it made a huge difference. Love the blue rug in there! I love the alphabet rug, but the blue just unifies the space…beautiful! They came with the lamps Mary, and the manufacturer no longer carries them. I bought them ages ago. I think those lamp shades could be replicated with some unbleached muslin and a nice stencil. If your current shades are a light solid color, just cover right over them. Great idea Donna. These lampshades are hand-painted and expensive, but a stencil is a great idea! I have a very similar room that needs a tweak. You’ve inspired me to rearrange it. Thank you. When I read you moved the bamboo rug I immediately went nooooo but somehow the blue rug makes the room look bigger! And it really makes your gorgeous furniture standout. Alicia, I know! I didn’t want to move it at first, but I love the blue rug in the study so much more. 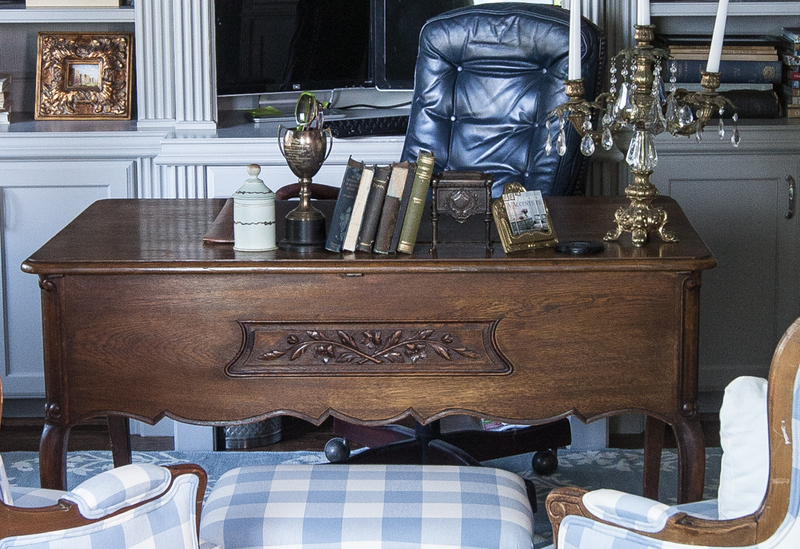 Hi Anita – what a pretty office space!! I love that rug with the chairs!! They look so nice together!! I always enjoy your site. Blue and white are my favorite. Those chairs are beautiful. Nice room. The blues are so refreshing. Love that wall unit too! Love the room with the blue rug, beautiful. The larger rug seems to better ground the furniture. Room actually appears to look larger to me. Beautiful. I love the new arrangement! I love seeing the finished product! Gives me so many ideas and also lets me know I’m on the right track with my own decorating. Your photos make me realize how much my office space needs work. I refer to it as the “cluttery”. Not a real word – clutter with a y on the end. But you get the idea! Such a beautiful shade of blue in all the fabrics. Love this room arrangement and buffalo print check on the chairs! Have you ever tried the desk under the window, so that you can look out as you work? And the chairs next to and behind you? I think that would be a very friendly arrangement! Something to think about. That’s a great idea Maureen! The new arrangement looks great. 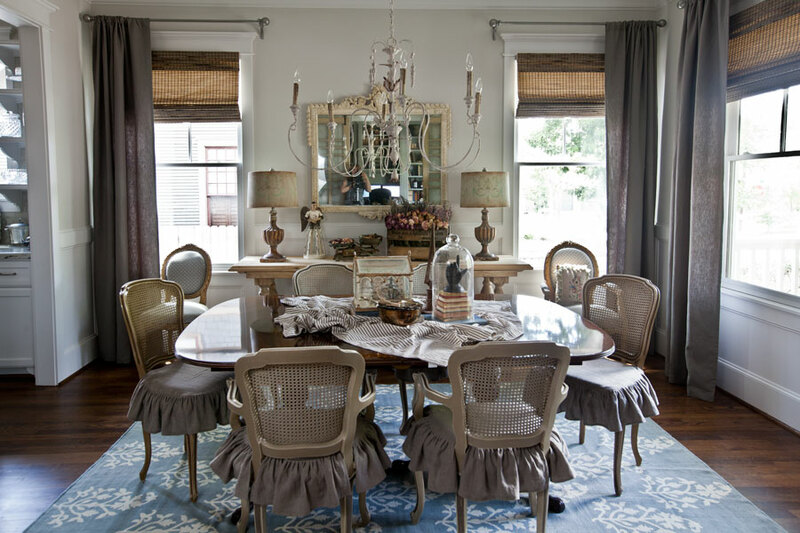 Love the rug and chairs! Yes, your room looks much better with the larger rug..and softer, too….I think one of the biggest mistakes we make is using rugs too small for the space. The softer rug and in blue makes your room look larger..good job..
New to your blog and learning so much. I have some of the same chairs and rugs you do, so this is a great help. Fantastic how you are able to use blue on blue. Love the fabric and the color mix. Replacing the alphabet rug with the blue is “calming”. Invites you in to sit a spell. Where do you recommend buying rugs from? Yes! Love the blue rug in there. It was meant to be. You’ve made your chairs very happy! Your ideas are so amazing & you are such an inspiration, thank you!! Love the changes! The blues pop more with the blue rug! Yes I love the new arrangement and that blue rug goes so well in the room! So excited to be the October winner, room arranging is one of the challenges I will have when we get together for the consult. I am so excited!!! I’m very excited too Brenda! I love the rug and chairs together. I also love how versatile your colors are to move things from one room to the other. Lovely! I live the mix of pattern, the carpet and check chairs. That color blue is so pretty. LOVE the alphabet rug and wondering where you purchased it, although I understand it is not longer available. The new room set up looks great too. Hope I am a winner! I think it was Decor Steals Cynthia. I love diagonal furniture choices—always try that first! Thanks for the viewing of your office. Your rooms and comments are such an inspiration to those of us looking for guidance on decorating. I am currently looking for a pair of loveseats to place next to a fireplace and it is such a challenge to find something. With your examples I have been able to decide what to look for! Wonderful, you have given me some ideas for our little library study! Beautiful room ether way. Love your style. Hope I’m entered in the giveaway! Yup Dominga! You should be entered. Would have ever th to move the chairs on the diagonal. Great idea. Can’t wait to see where the rug moves to…perhaps your mountain home? Oh good thought Sandie! I’ll be showing it hopefully next week. Thanks for showing the process as well as the results! 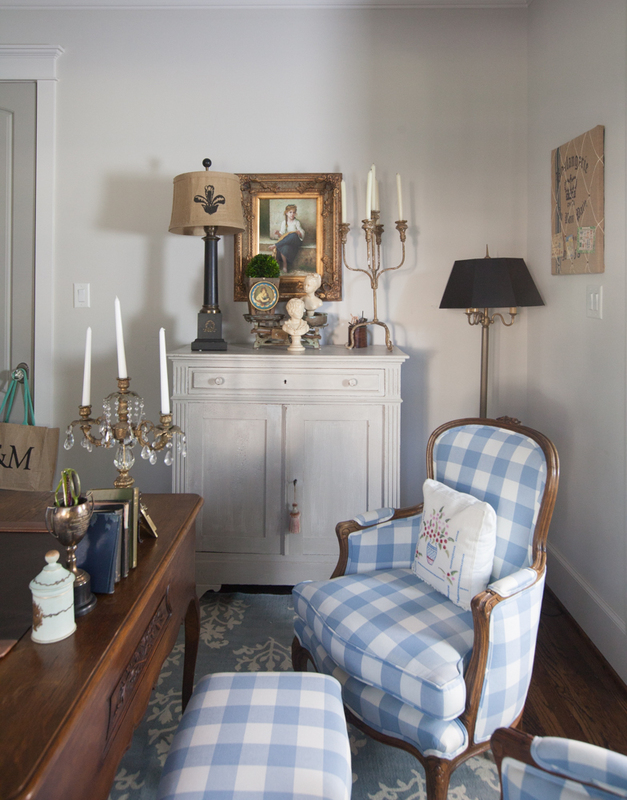 I love the lines of French furniture and your decorating style. 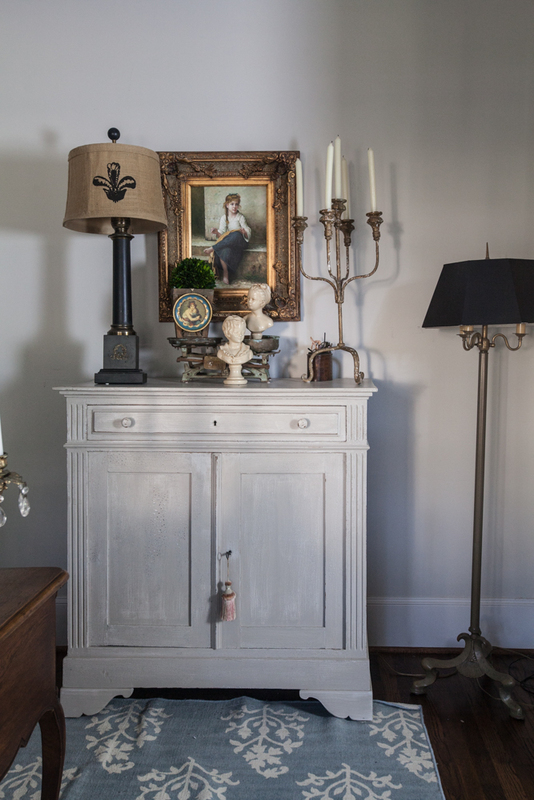 I just updated my country French hutch by replacing the glass with wood, adding Efex appliques and painting it a soft antique gray. It looks like an old armoire now and I love it! Now I want to find two side chairs to go on either side. Your posts are a great inspiration! Moving that blue rug to your office was absolutely the perfect thing to do! What a difference! I loved the other tan French looking rug, but it doesn’t do what this rug does!! Excellent choice to change that out!! Yummy. The new rug is great! Nice room arrangement, too. Love the blue chairs and rug and the way you arranged the room. 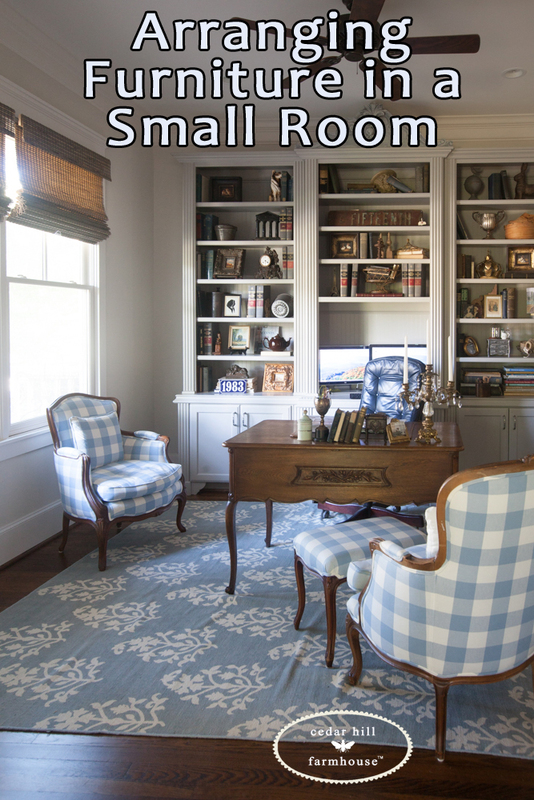 The blue rug made such a difference under the darker desk and bookshelves! enjoyed the post as always! A great office…love the desk, not too big. Is it an antique? Great job with the new rug and furniture arrangement! Love Rugs my one thing love to change up a room ! ??? Love both rugs, but think the blue gives the room a much more cohesive look. I have the same Alphabet Bamboo “rug” and have stashed it for quite a long while to use in our kitchen ~ after a couple other changes. I can’t wait to see what you do with yours! 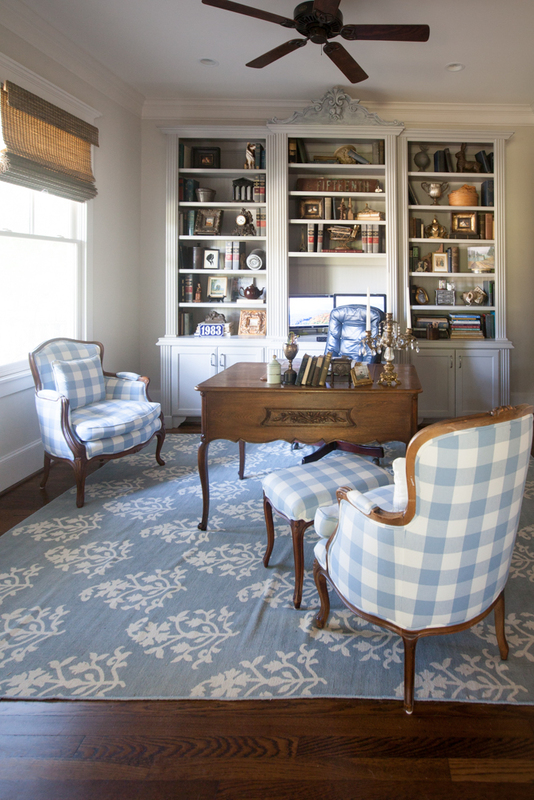 Love the blue rug in your office! When you had your chairs redone, did you have the insides changed, such as more padding, down cushions, etc? I love how changing one thing refreshes a room. Small changes help us to appreciate the things we have. Great job. I love the look of that room. I could spend hours in there. It’s very calming. Love the book shelves. I do prefer the blue rug as well. I do like the blue rug and the new arrangement in your study. It always surprises me the difference moving a few things makes in a room. (And my husband walks in and just smiles.) Thank you, Anita. I hope I can find the alphabet rug for my calligraphy area when I determine what size I want to use. love the blue and the new ‘do in your office. In my eyes, it is more soothing and classy! Lovely! Oh, how I love the Buffalo check chairs! And the carpet with it is just marvellous. I lost my husband two weeks ago and now trying to figure out how to make a “me space” in a room at my daughters home. Someday, I may pay for a consult with you! What to keep, what to give away. Can’t make decisions now. I love your style. I’m a farmhouse frenchie at heart. God Bless. I would love an alphabet rug! Thanks for the inspiration! I love your style! 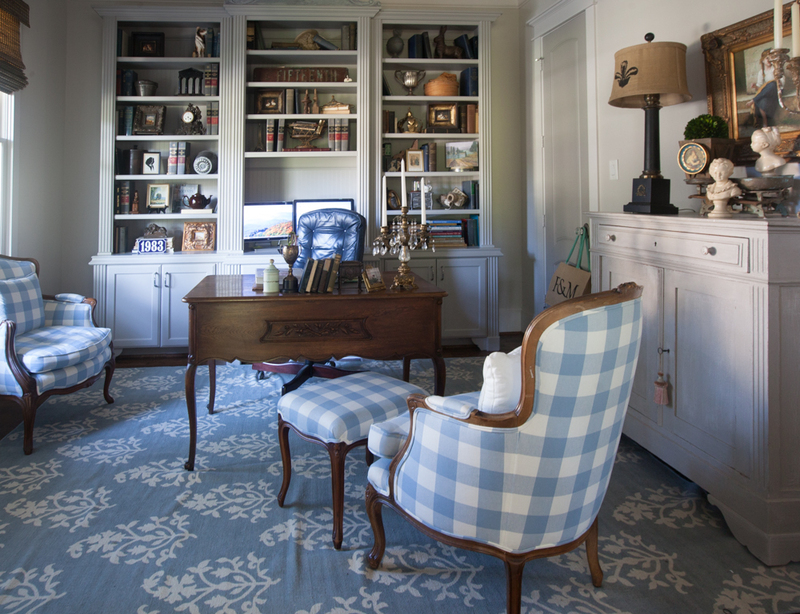 I love the blue rug in your study – it looks like it was meant for this space. The chairs look really good done in the diagonal layout, too. Your study is a lovely room. Your office has such a calming and relaxed feeling. I wouldn’t mind having to go to work there! Thank you for the inspiration! My main floor is one big great room with 1 very long walk. Tougher to arrange than one would think. We’ve had it different ways but comfort is always a work in progress. May make some adjustments this week ? Anita, the room looks amazing with the new rug (the bamboo tattoo rug is my favorite I do have to say). The bigger rug just makes the room blossom. I like the arrangement of the chairs, as well. Thank you for sharing. Was wondering earlier today about furniture placement, rug size in a small room that will become a den. And there was your beautiful new office arrangement. Thank you for all of the advice, photos, projects and inspiration. Always look forward to hearing from you via email and Facebook. You always have great ideas! I do have to say I liked the original placement of furnature and love both rugs. I was laughing as I went through your changes — I thought the original letter rug looked terrific! Then along came the blue rug… hmmm! Even better! Amazing! Thanks for the idea. Love it, looks really nice and classy. Your office is beautiful. Love it. 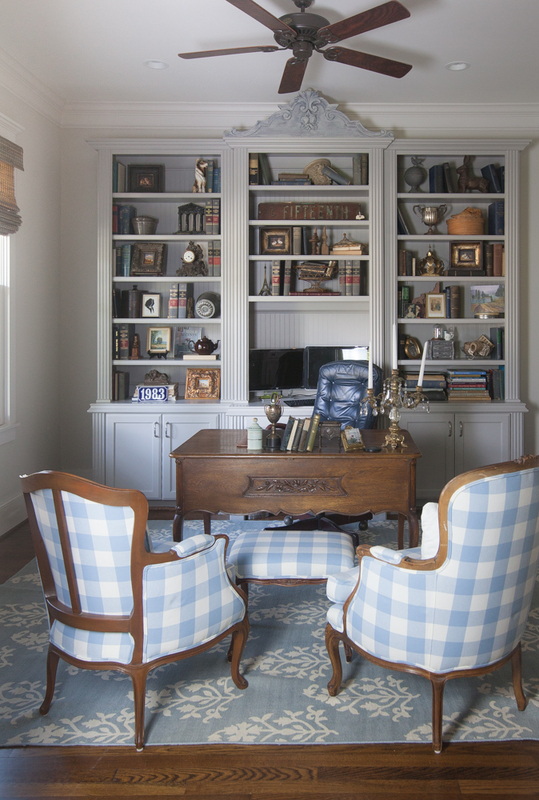 The blue rug looks fantastic with the blue checked chairs. I love your style. And your book is great! I love everything about the before and after! The rug and chairs are to die for? Anita, I love the cabinet in your study and how you have displayed it. The blue chairs and rug make the room complete. Love that painting/picture of the girl, in the gold frame. I always struggle when I want to arrange furniture in my living room. I have small living room and I want to decorate it beautifully. Now I have Great ideas for furniture arrangement in living rooms. I will implement all the ideas suggested in the article to make my living room unique. Thanks for sharing. Thank you Amanda. I hope it goes well! Anita – I love your arrangement and everything in your office! I’d never want to leave! Love that rug in there!! I love your site! I look forward to the emails! The blue in the room is so peaceful! Really makes a difference with the blue rug in the room. Like it!! Looks great and I love the blue rug! I loved the first rug . . . . until I saw the blue rug. It really softens the room and looks wonderful. The chairs are so attractive and practical/comfy with the foot stools… and contrast nicely with the desk! LOVE the blue rug as well!! Happy Holidays!!! !